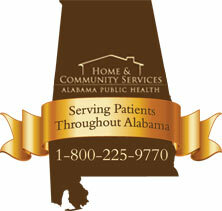 The Bureau of Home and Community Services administers statewide home care programs for the Alabama Department of Public Health. Receiving services at home allows elderly and/or disabled citizens to remain in their homes longer, and often with better outcomes. Home care can also eliminate or delay the need to enter a nursing home. Services are provided by registered nurses, licensed practical nurses, home health aides, social workers, and therapists. The eligibility requirements vary from one program to another and can depend on such factors as age, disability, or socio-economic status.